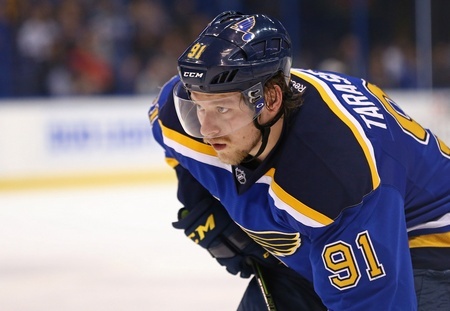 To say the St. Louis Blues are expecting more out of Vladimir Tarasenko would be a considerable understatement. The 24-year-old forward from Yaroslavl has 13 points in 17 playoff games this year, but he’s run into a proverbial wall against the San Jose Sharks in the Western Conference Final and has been held without a point for three games. To hear head coach Ken Hitchcock tell it, it’s all part of gaining valuable experience. And to be fair, the entire team is learning some hard lessons right now. The Sharks have shut them out in the last two games of the series and has outscored them 8-2 over the course of three games. Only David Backes and Jori Lehtera have goals against San Jose thus far. But Tarasenko’s struggles in the post-season have been well-documented, with Hitchcock playing around with his ice time and trying all sorts of different line combinations to get his man going. In the regular season, Tarasenko had 74 points in 80 games. Obviously, expectations were sky-high in the playoffs and the forward did respond through stretches. He took tough assignments against the Dallas Stars and Chicago Blackhawks and still put up respectable numbers. The trouble right now is that he’s got to do more. Naturally, there are a number of excuses you could make. Tarasenko is, after all, playing in his first conference final. And the team isn’t getting scoring from anyone else against the Sharks, with the best players far from the best players. And San Jose is containing him with some impressive double-coverage, which suggests that looking to Tarasenko alone is a major problem. Perhaps this amounts to the usual hockey chatter, wherein fans look to place the blame on one or two players when it’s a total team breakdown that’s led to such dismal play. The numbers certainly suggest that the Blues have failed as a unit against the Sharks, but the intangibles suggest that better play from Tarasenko could jumpstart the club in the Western Conference Final. Whether or not that happens in time remains to be seen. Next Are the Rangers Looking to Trade Rick Nash?